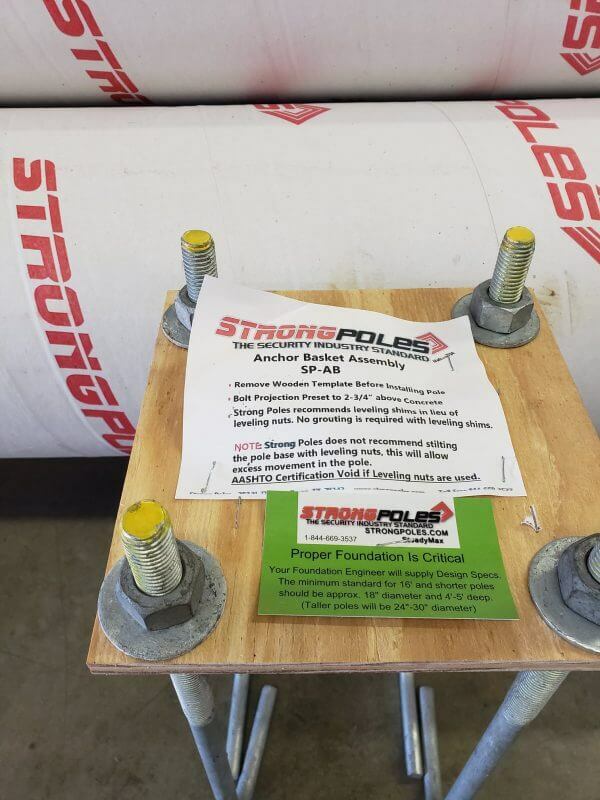 Here are some of our recommendations for the foundation and anchor assembly for our Security Camera Poles, a proper foundation will ensure the longevity of your pole. The foundation should be concrete (for precise depth and width consult a foundation engineer). To help streamline the construction schedule, we have three sizes of Concrete Forms. The 18″5′ StrongForms are for the 4″ Square Pole Line, SteadyMax SP-SM12, and SteadyMax SP-SM16. The 24″5′ StrongForms are for the SteadyMax SP-SM20. The 30″6′ StrongForms are for the SteadyMax SP-SM25. The Anchor assembly recommendations are 18″ to 36″ in anchor length and the bolt projection being 2 1/4″ to 2 3/4″. Our SteadyMax series of poles the anchor basket is included, but with our 4″ Square Poles there are two options to purchase for the anchor basket which depends on the type of base purchase with the pole. Our anchor baskets are pre-assembled, with all the hardware, including hot-dipped galvanized anchor cage with pre-installed positioning plate, washers and hex nuts. The anchor basket makes installations much faster, and alignment much more manageable. Simply push the anchor basket down into wet concrete until the template is flush with the top of the concrete, and be sure that the conduit rises well above the hole in the template. After the concrete has cured remove the wooden template and install your pole (leveling shims may be used in lieu of leveling nuts). With proper foundation and anchor basket assembly, your security camera poles will be there for many years to come. For more information or questions, please contact one of our Sales Engineers at 844-669-3537 or visit our website. This entry was posted in Camera Poles, Camera Security Poles, Commercial Security Camera Poles, Security Camera Poles, Surveillance Camera Poles and tagged installation, Security Camera Poles.